Nothing says summer like barbecue! 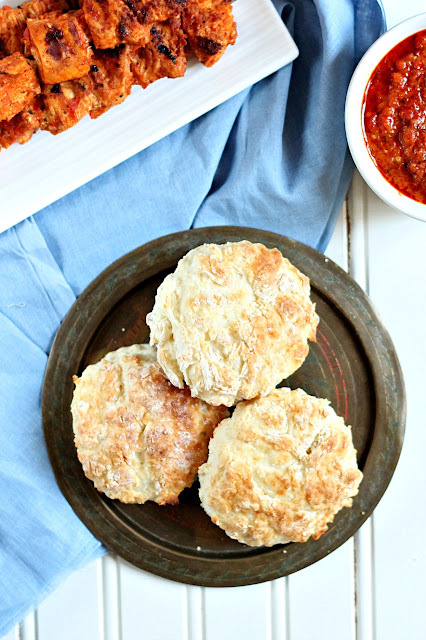 Today I'm sharing a recipe for Sour Cream Biscuits that would work wonderfully as a side to some grilled dishes. When having a barbecue, we always like to have some type of bread to go along with the meal. These biscuits are made with Gay Lea Gold Premium Sour Cream. Typically, biscuits are made with butter. These have no butter or oil. There is no cutting in butter which makes them very fast to make! They look a little dry in the picture but they are in fact moist. For a better colour, you could brush some melted butter on top. Gay Lea Gold Premium Sour Cream is nut-free and certified Kosher. It's only available in Ontario. Gay Lea Sour Cream also comes in Regular, Low Fat, Fat Free and Lactose-Free. Any leftover biscuits can be used the next day for breakfast with some butter and jam. If you also have some leftovers from your barbecue, you could shred up the meat and make a sandwich with the biscuit! We had them with some delicious Peri Peri Chicken. To help you get started on your barbecue, Gay Lea is giving one Chocolate & Chillies reader a Gay Lea "BBQ" kit that also contains a one year supply of Gay Lea product coupons. The contest ends July 31, 2015. You may enter on multiple blogs but can win only one prize. This contest is open to Canadian residents excluding Quebec. Please use the Rafflecopter below to enter. Add the sour cream and milk. Mix until combined. You may need to add a little more milk to get the dough to come together. I added an additional 2 more tablespoons. Transfer dough to a lightly floured surface. Knead 8-10 times. Flatten dough into a circle that is 1/2" thick. Using a round cutter, cut out biscuits and transfer to prepared baking sheet. Bake about 8 minutes until golden brown. Would love to win:) I wanted to always try baming biscuits. I'd make my quacamole using sourcreeam...It's soooo good! I use sour cream with chicken quesadilla. I use a sour cream topping for my cheesecakes. Awesome,thanks for the chance,I love Gay Lea products. Oooh I see that these were served with your Peri Peri Chicken :) Looks great! Can't believe there's no butter! Yum...love biscuits. My hubby's a Southern boy so I make biscuits for him on occasion. Sour cream is great for so many things! Makes everything so moist and....buttery! Is this recipe really without any butter or shortening? Yes that is correct! 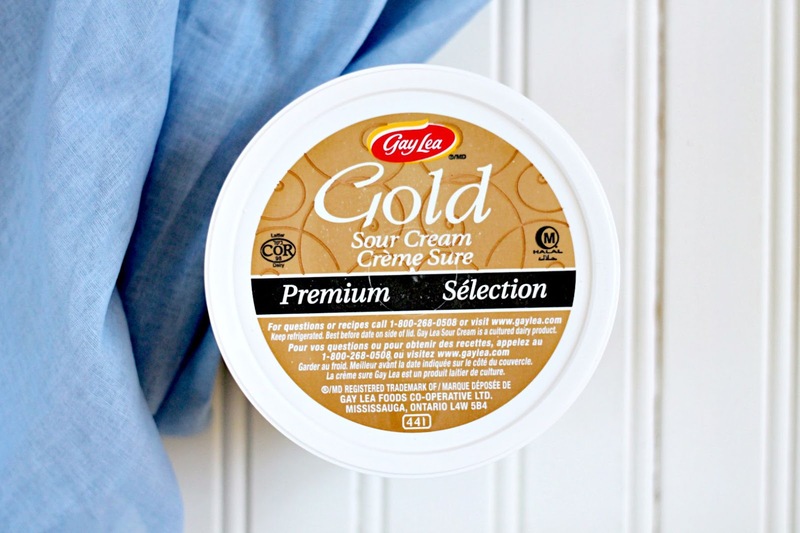 The Gay Lea Gold sour cream is very rich and thick!